Good morning! I can’t believe its Monday again, what happened to the weekend? As always, I hope that everyone managed to make the most of the weather and had relaxing couple of days. How amazing was the football? Anyway, I’ve got something a little different today; a look at my top five blog posts. I got the inspiration for this post from one of my favourite bloggers; Alana. In order to find out my top five posts, I delved into my all-time stats. My most popular couple of posts were quite predictable; the rest, a little surprising. This post has received five times as many views as any other post I’ve written. I personally don’t think that it’s one of my best posts. I wouldn’t even put it in my Top 20. The post was published back in 2016 and is still read by 100+ people a day. Rubbish stats for most bloggers but pretty amazing stats for my small corner of the internet. I published this post the month before the 2017 London Marathon and made slightly more effort than usual to promote it on social media. Predictably, this post was really popular in the lead up to the 2018 London and Brighton Marathons. I’m guessing it will be popular again next March and April as nervous marathon runners get Googling. This is another example of a not very good blog post that for some reason gets a lot of views. I can only assume that quite a few runners struggle to reach their London Marathon fundraising targets. I most definitely did! This is by far and away my most popular ‘product review’ post. I’ve written what I think are far, far more interesting product reviews but I guess that at the end of the day, it’s all about the product. Or perhaps people just like this rather dodgy photo of me trying to avoid throwing up after a challenging training session? I’ve still got no idea why I included it in the FLEXISEQ post. And finally, in fifth place is a review post I published last summer. Thriva are constantly promoting their products on social media. Although I did very little to promote this post, I think that it’s popular because people like to read unbiased reviews before taking out expensive subscriptions. Well that’s my theory. If you’ve reached the end of this somewhat self-indulgent post then thanks. At some stage, I might take a look at my bottom five posts. It will be interesting to see which posts ‘flopped’ and are now gathering dust inside my blog. I’m quite nosey so I’d love other bloggers to share similar posts. Please get writing! As 2016 is nearly over, I’ve decided to write a review of my running highlights and lessons learned throughout the year. If you don’t enjoy reading review posts then please leave my blog now, I promise that I won’t be offended. I’m nosey and really, really enjoy reading about other runner’s progress, so please do get writing and sharing. Following a slightly disappointing 2015 – stupid injuries – at the start of January I was working my way through the Couch to 5k training plan. I was also nursing a slightly niggly right knee. Rather unexpectedly I equalled my parkrun PB of 27:33 at my local parkrun – Walsall Arboretum – towards the end of the month. I still have no idea where that sub-30 minute time came from. However, the main running highlight of January was winning a place in the London Marathon. While I knew that whatever happened in April I would complete the marathon distance, I quickly discovered that I lacked both the mileage base and fitness required to run long distances. I decided to adopt a run-walk-run training strategy. February was a mixed month. Although I successfully completed the Couch to 5k training plan and achieved a parkrun PB of 26:49, a foot niggle meant that my marathon training was extremely limited. Once again I was reminded that my left foot and right knee could not cope with running longer distances. I started to feel concerned that any attempt to complete the London Marathon would cause another long-term injury. While I was unable to run, I did my best to maintain my fitness levels by swimming five days a week in preparation for Swimathon. The swimming, break from running and expensive physio sessions seemed to temporarily cure my knee niggle, and I was able to successfully complete 10 and 11 mile training runs at the beginning of the month. Although I missed the Mash March Madness 10k trail run in Cannock Chase due to a lack of transport, a week later I completed the 7 Pools Run, a challenging cross country run in Sutton Park, without taking a walking break. Unfortunately, I ended March with elbow and knee injuries. Evidently running a challenging 10k cross country event wasn’t very sensible. At the grand old age of 36, I was finally starting to fall to pieces. I accepted that the London Marathon would be a painful and not very positive race experience. The main focus of April was the London Marathon. My niggly left foot and right knee meant that my training in the lead up to the marathon was virtually nonexistent. Not ideal. Some mornings my niggles disappeared, other mornings I woke up and was barely able to walk. I started to suspect that the ‘niggles’ were all in my mind. Despite my negativity and lack of training, I somehow managed to complete the marathon distance. I made the fatal error of thinking I could keep up with the Runner’s World ‘run-walk-run’ pacer. I managed to power walk and run to the half-way point. Shortly after running across Tower Bridge – the atmosphere was bloody amazing – I was clipped from behind and jarred my injury-prone right knee. The second half of the marathon was miserable, cold and painful, and as I hobbled towards the finish line in the less than impressive time of 5 hours 59 minutes and 45 seconds, I accepted that my marathon running days were over. I shared my honest review of the London Marathon on social media and the subsequent surge in traffic temporarily broke my blog. A week after the London Marathon I felt ready to run again. I guess that walking the majority of the 26.2 miles had some advantages… Not following a training plan for the first time in 2016 was great, and in an attempt to rediscover my running mojo I decided to focus on running shorter distances. The highlights of May were running consistently and completing the Hill West 10k in the not too shabby time of 62:18. I met Matt for the first time; it was great to put a face to the twitter name! Looking back, if I ignore the fact I celebrated (?) my 37th birthday, May was a great month. June was a month of running ups and downs. At the start of the month I had a really enjoyable 8.5 mile run around Sutton Coldfield, and completed the Great Midlands Fun Run in a respectable (for me) time. When the official results were published I discovered that I’d somehow knocked 30 minutes off my 2015 time! Unfortunately, due to a slightly forgetful friend I didn’t make it to the start line of the Aldridge 10k and wasted more money on race entry fees. The following Saturday evening I enjoyed a few too many beers, and the next morning had to drop out of the Race for Life at the end of the first lap. Recording my first ever ‘DNF’ made me briefly question my commitment to running. July saw the start of my Great Birmingham Run training and my progression towards feeling more like a ‘real’ runner; the walking breaks were finally eliminated from my training runs! I decided to write weekly Great Birmingham Run training updates – apologies if I bored you to tears – in an attempt to make myself more accountable. Although I didn’t complete any organised races during July, I successfully negotiated the first few weeks of my half marathon training and managed to remain injury free. My half marathon training continued and I somehow managed to run continuously for over an hour. Both my fitness and my confidence levels were increasing, the half marathon training plan was working. I discovered my love of early morning, and will never forget watching the sunrise during some of my long Sunday morning runs. Although I didn’t enter any official races, I finally made it back to Walsall Arboretum parkrun and completed the 5k distance in 28:05. Although I enjoyed running with others, I had got used to my early morning runs and running at my own pace. All in all, August was great! At the start of the month I completed the more challenging than I had remembered Lichfield 10k. Although I finally managed to bag myself a sub-60 minute 10k, I ran like a plonker and was reminded of the importance of running my own race at my own pace. My half marathon training progressed well and I found running for almost two hours both enjoyable and relatively easy. I set out a series of gold, silver and bronze half marathon time goals, and after running 130 kilometres during September, looked forward to the start of my half marathon taper. One event – the Great Birmingham Run – dominated my thoughts and training during the first half of October. I successfully completed a two hour training run and then caught Freshers’ Flu. Fortunately, my dose of the lurgy coincided with the beginning of my half marathon taper, and I felt more or less fully recovered as I stood shivering in the rain waiting for the Great Birmingham Run to start. The race itself didn’t exactly go to plan… I set out far too fast, ran out of steam at 8 miles, walked more than I ran, was unable to run down any of the numerous hills and hobbled across the finish line in tears. The highlight of the day was bumping into Matt in the chaos at the finish and getting a lift home. Matt’s kindness meant that I avoided travelling home on an overcrowded train. Thanks again Matt. I got home, had a shower, ate three packets of crisps, drank far too much Diet Coke, sulked and wrote a detailed race review. I sulked some more, reflected on what went wrong, hid my trainers and made myself take a break from running. A couple of weeks later I entered the Cambridge Half Marathon. Cambridge has to be less undulating and more knee friendly than Birmingham. Although November has always been my least favourite month – I’m not a fan of the dark afternoons and evenings – I was determined to adopt a positive attitude. After finally drawing a line under the Great Birmingham Run, I was looking forward to getting back into some sort of routine and starting my Cambridge Half training. I completed a short run at the start of the month and felt like I could have carried on running for hours. Unfortunately, later on that day I started to feel unwell and the toilet became my best friend. Thanks to norovirus I was unable to run for a couple of weeks due to a complete lack of energy, the Birmingham MoRun was yet another ‘DNS’. At least I started my Cambridge Half marathon training feeling very well rested and niggle-free! I’ve just worked out that I’ve run the not so impressive total of 5 kilometres so far during December. The combination of a niggly right knee, the lurgy and working 40+ hours a week in retail has resulted in me completely losing my running mojo. I’ve treated myself to colourful running gear I don’t really need, entered a couple of 10k races, looked at my medals from this year and charged my Garmin. For some reason I just don’t want to run at the moment. I’m starting to think that I should listen to my body and hide my trainers for the remainder of the year. Perhaps it’s time for me to think about my running goals for 2017? One should be to reduce the amount of times I wear purple running gear. Perhaps I should just ignore November and December!? After all, if I ignore the last couple of months, 2016 has been my most consistent year of running in almost a decade. According to Strava I’ve run exactly 700 kilometres during the year, I’ve decided I quite like the number 700. Do you have any running or health and fitness goals for 2017? At the moment my running goals are to run more consistently, to manage my knee and foot niggles and to hopefully run 1000 miles. As for health and fitness goals, I’m planning on cutting down on the amount of Diet Coke I consume. Finally, a slightly random question… do you have a favourite colour? Purple isn’t actually my favourite colour! *Disclaimer* Please note that all of the below are my personal tips. Although I’m not a qualified running coach (yet) I have first-hand experience of the Couch to 5k (C25K) training plan. I would recommend that before commencing the C25K training plan you can walk comfortably for an hour. If you can’t, build up your walking first and then start the C25K. In November I started the C25K training plan for the third time. I followed this version of the C25K, and eight weeks later I successfully ran 5 kilometres around the streets of Four Oaks. Following an enforced break from running due to a knee injury, the C25K had helped me to get back up and running again. Looking back, 10 things helped me to complete the C25K. 1. Buy a decent pair of running shoes. If you are completely new to running you may not have any suitable clothing. A decent pair of running shoes is essential. Female runners should also consider purchasing a sports bra. You don’t really need technical gear to start with. Just wear clothes that are loose fitting and comfortable in a breathable material such as cotton. If you do want to invest in technical running gear then shop around for bargains. The majority of my running clothes were purchased from TK Maxx, eBay and H&M. Running doesn’t have to be an expensive sport. 2. Remember to warm-up and to cool down. Each training session starts with a five minute brisk walk. This is perhaps the most important component of each training session as it ensures that your joints are lubricated and prepared for activity. The five minute brisk walk at the end of each final run repetition removes the temptation of stopping running and immediately sitting down and enables you to cool down properly. I may or may not have been guilty of doing this in the past. 3. Don’t run on consecutive days. When you follow the C25K you run three times a week. I scheduled my training runs for a Monday, Wednesday and Friday/Saturday and made sure I didn’t run on consecutive days. When your running is going well is can be tempting to skip a rest day to fit in an extra run, please don’t! I personally believe that rest days form the most important component of any training plan as they enable the body to recover. 4. Monitor and share your progress. I found keeping track of my progress really motivating. I logged all of my training sessions on Fetch Everyone and spent far too long analysing the data from my GPS. If you don’t have access to a GPS device then I recommend downloading a running app for example Runkeeper or Strava. I uploaded each session onto Strava and shared my progress on social media. Although my family and friends don’t understand my “running obsession” other runners are generally very supportive. 5. It is okay to repeat a training session. Repeat certain training sessions and weeks if required. If you struggle to complete one of the training sessions then I would recommend repeating that session. The second time I followed the C25K I found myself repeating Week Six three times. 7. Comparison is the thief of joy. It took me a long time to stop comparing my running achievements to the achievements of other runners on social media. At times it felt as if everyone else was running further and faster. Ignore the Strava and twitter feeds and concentrate on your own achievements. 8. Mix it up. Plan some good running routes and mix it up. The best running routes are free from traffic, have good lighting and are scenic. You can run anywhere that is safe. If I run along the same roads every time I run I soon get bored. I actually find running slightly easier if I don’t know exactly where the next hill is located. Explore your local neighbourhood. If possible get off the pavements and into your local park and onto the trails. 9. On the day of your final run. I completed the final 5 kilometre run that marks the end of the C25K on my own around my local neighbourhood. I would, however, recommend completing your first 5 kilometre run with others if at all possible, by heading to your local parkrun. Running with others will really help you to successfully complete the C25K. 10. Enjoy your running! If you are a complete beginner none of the weeks are easy. There will be times when you want to quit. You will ache as your body adapts. I can guarantee that the satisfaction and pride you will feel at the end of the C25K will make all of the challenging training sessions worthwhile. Have I missed anything? Do you have any tips for completing the C25K? NHS Couch to 5K – Live Well: http://www.nhs.uk/Livewell/c25k/Pages/couch-to-5k.aspx includes a 9-week version of the C25K and links to loads of useful resources. Mapometer: http://gb.mapometer.com/ useful for accurately measuring out potential routes. At the start of September I ignored the warning signs (i.e. pain in my left foot) & completed a 5K run in Sutton Park. The following morning my left foot was twice the size of my right foot & I was in agony. I was sensible, stopped running (the pain didn’t leave me with much choice) & decided to seek the opinion of a local sports physio. The physio promptly diagnosed metatasalgia & suggested that I would be able to return to running within a couple of weeks. Although the physio had assured me that I didn’t have a stress fracture, I wasn’t so sure as my foot was so painful. I’ve always been taught to trust the professionals, so I assumed that I was being a hypochondriac & that the physio was correct. Perhaps my foot just needed more time? I ended up spending £200 on five physio sessions. Looking back I have no idea what I actually paid for. During the final session the physio suggested that I get my foot X-rayed. 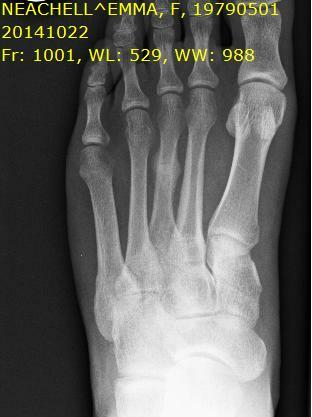 Fast forward another week & an X-ray finally confirmed my suspicions… Luckily for me the stress fracture was healing nicely & there weren’t any complications. A week after my visit to A&E (yes I did feel like a time waster!) a Consultant in the Orthopaedic and Rehabilitation Centre discharged me & said that I should be able to start running again in a couple of weeks. I was told not to do too much & to stop running immediately if the pain returned. I decided that I would follow the Couch to 5K (C25K) training plan, and on Monday November 17th I tentatively ran for the first time since my left foot decided to fall apart (slight exaggeration). My left foot felt fine, I didn’t die, I was a runner again! I’ve decided to write a series of short blog posts to share my experiences of the C25K. The C25K training plan lasts for nine weeks & I will blog at the end of every three weeks of training. Yesterday I successfully completed the final training session of Week 3. Get me actually following a training plan! Each week the training sessions have incorporated longer running repetitions & have been progressively more challenging. I feel that my fitness levels are gradually improving & my pace has increased with each session. Although I found the first three minute running repetitions in Week 3 challenging, I am already looking forward to the challenge of Week 4 & to running for five minutes. To be honest the C25K training plan has been far more challenging than I anticipated. Although I hadn’t run since the start of September, I assumed that I had maintained a level of fitness through my walking & cycling. I thought that I would find the C25K relatively easy. I was wrong! I now respect the C25K training plan & everyone who has got off their arse couch & attempted to complete the training plan. Those first few steps really are the hardest! The C25K is easy to follow (although I suspect that I got some of timings of the various repetitions wrong!). The C25K has enabled me to make an injury-free *touch wood* return to running. There is no danger of me doing too much too soon. Running three days a week enables effective recovery after each training session. The short duration of the repetitions means that I have spent more time looking at my Garmin than at my surroundings (this is only an issue in Weeks 1-4). I have struggled to keep warm during the five minute “warm-up” & during some of the walking recovery repetitions. After a weekend of resting & stretching I am looking forward to starting Week 4 on Monday. Hopefully my foot will continue to behave itself as I am really enjoying my running at the moment.